But if multiplayer isn't your thing, or if you think the idea of playing a nameless Autobot or Decepticon grunt is lame - where's my Optimus Prime, dammit?! - the singleplayer modes are where you'll want to go. War for Cybertron contains two full story campaigns, one for the Autobots and one for the Decepticons, and yes, you'll be playing as the Transformers. I was able to play through a level of the Decepticon campaign with two others - both campaigns fully support three-person co-op from beginning to end - during which Megatron and his followers were attempting to track down the mysterious Dark Energon as well as recruit Starscream to their cause. 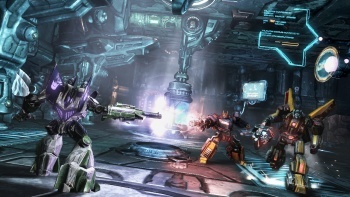 The gameplay itself was just as solid as in the multiplayer, and while the gunmetal gray environments of the Cybertronian installation did begin to feel a bit same-y, they were nicely broken up by moments with more color, like the moment when the three Decepticons took a detour through an old furnace (filled with spinning blades and heat jets, naturally - Cybertron must not have OSHA regulations). It's slightly annoying to have to restart from the most recent checkpoint if only one of your three members goes down and isn't revived, but checkpoints are common so it's rarely a huge setback. Transformers fans should get a kick out of everything here. Where the developers couldn't get the original voice actors, the replacements do passable jobs, and the entire thing does feel like it was made by people who genuinely love and respect the source material of the Transformers lore and backstory. We also were able to see the brand-new, just-unveiled Escalation mode, which is essentially War for Cybertron's take on the by-now-standard "Horde mode." You and three other Autobots or Decepticons must hold the line against wave after wave of incoming enemies, and earn points which can be spent on new weapons, health and ammo refills, and opening doors to other, more easily defensible parts of the map. While Escalation is essentially just "Decepticon Zombies," it actually works quite well - the enemies are all nicely varied, from little zippy spider 'bots and stealthy assassins to melee-focused berserkers and damnable enemies carrying lethal rocket launchers. You, too, have many more tools at your disposal than just guns: Imagine if you could turn into a jet in Call of Duty and fly around blasting the zombies. Sounds fun, doesn't it? A particularly nice touch is the ability to essentially pool your points together, letting you open doors more quickly and purchase health and ammo for your teammates who might need it more than you.